Image created by Matt Cavanaugh. Where do we direct our blows? How do we most effectively and efficiently achieve victory? What does “victory” even mean anymore? These are hard questions a lot of smart people encounter in the most stressful of human interactions – at war. Yet we often skip straight to these issues before we consider the opponent’s nature and political culture. And one hallmark of our current environment is the absence of competitors with unitary state structures (North Korea is a notable exception). At one point, it was common to defeat a warrior-king, a Napoleon or a Hitler – and a victor would score simultaneous victories over the military, elites, and people in one single blow. I like to call that the “single haymaker” theory of strategic victory. Those days are clearly over as our opponents are more appropriately characterized as continually shifting Rubik’s cubes. Modern wars are contested in three places: fought on fields of fire for victory, prosecuted by politicians for power, and argued through advocates for an accepted narrative. The military creates the monopoly of violence; politicians certify this new monopoly; and the people consecrate the monopoly on violence by choosing a particular narrative that supports the monopoly’s continuance. Why does this matter? For one, this helps guide one to answers to the questions at the outset of this short essay. But let’s look more specifically. An army fights at the direction of political elites which in turn represent some body of people. Critical issue: how connected are those three groups? In Afghanistan, the army fights for Kabul and a few other large cities…but there’s a significant rural population that does not fall under the writ of the Afghan government. And so even if we win militarily in this region, even if there are political agreements, we must still impose our will via some strategic narrative upon the minds of men. And that seems unlikely to ever occur in some part of Afghanistan. One other quick example. Right now, in Northern Iraq, Shia militias are aiding Iraqi governmental military forces in the fight against ISIS. This is useful militarily, however, likely devastating politically and for the war’s strategic narrative. ISIS grew in a petri dish of Sunni resentment toward Shia political dominance – the people in the area now controlled by ISIS already don’t like the Shia – and now the Shia are fighting for military conquest in the region the Baghdad/Shia government has already abused politically? How will that story going to play out in the long run? Will the Sunni locals accept this narrative? I doubt it. One other subtle point. The human head weighs about 7 percent of a human’s total body weight while the arms weigh about 5 percent. The body (from the torso down, including the heart) is a person’s mass. Perhaps in today’s world, just as the metaphor in the image is apportioned, defeating the military (arms) and convincing the political elite (head) may be challenging while also the relatively smaller part of the total effort in modern warfare. 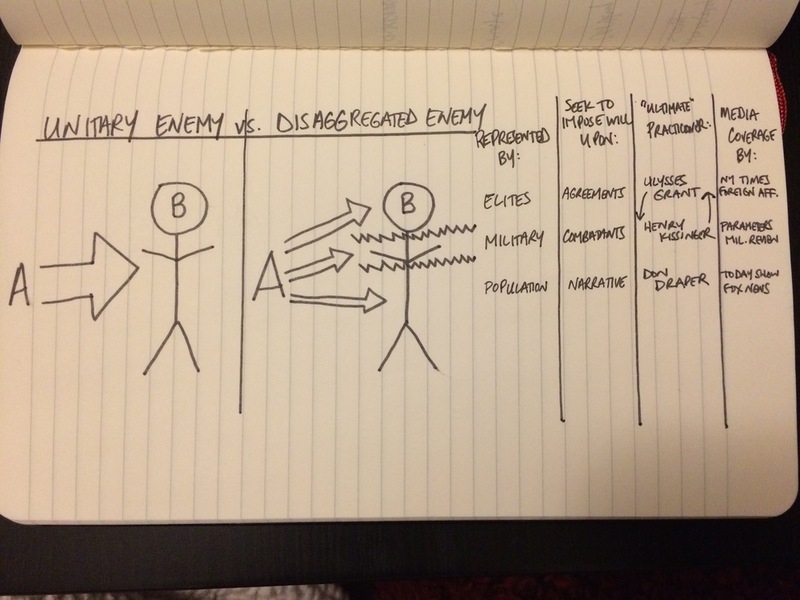 In short, when facing a disaggregated enemy, the strategic narrative matters more. Just curious, shouldn’t Kissinger and Grant be switched in the image – since Grant was military and Kissinger was an elite?